What’s a little more glass and metal in a town overrun by supertalls, right? 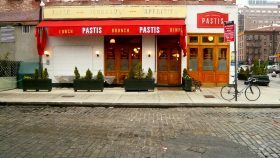 After getting shot down by the Landmarks Preservation Commission (LPC) for their design of a two-story, mixed-use glass crown to top the Pastis Building in the Meatpacking District, BKSK Architects went back to the drawing board only to emerge with a new idea that’s won the LPC’s blessing. 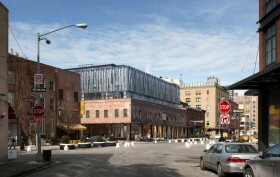 Set to top the low-rise brick building at 9–19 9th Avenue, the redesign is a somewhat more subdued iteration that uses the same materials and form, but with much less glass.